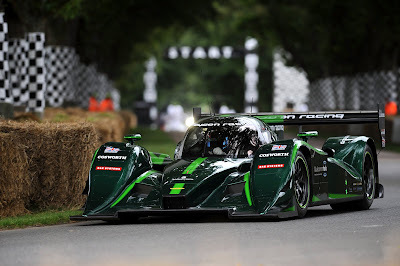 Drayson Racing Technologies recorded a historic milestone in the development of electric vehicle technology this weekend as it debuted its electric-powered prototype racing car, the B12/69EV, and achieved a new record for electric cars in front of the thousands of motoring fans at this year’s Goodwood Festival of Speed hillclimb. Paul Drayson’s second timed run of the day on Sunday 1st July of 53.91 seconds placed the car eleventh overall and fastest electric car. The unique electric Le Mans prototype racing car attracted a great deal of attention throughout the event both on and off the track, with the crowds amazed by the performance of the B12/69EV, in what was a world first viewing of this technology in action. The zero-emissions racing car performed faultlessly all weekend, demonstrating both the exhilarating performance and solid reliability of its 850 horsepower electric drivetrain. The Drayson technical team were also pleased with the range achieved by the car’s battery and wireless charging system over the weekend. The Goodwood Festival of Speed is one of the most prestigious public events of its kind in Europe and attracts some of the most influential names from across the automotive industry and motorsport worlds. Manufacturers, teams and collectors from across the globe head to the Goodwood Estate, in West Sussex, to showcase their cars and products to the thousands of visitors, for four days of motoring celebration. This year’s event was a sell-out and attracted over 180,000 visitors. The B12/69EV was unveiled at Autosport International 2012, in January. It was here that visitors were able to learn first-hand about the technical innovations behind the ground-breaking vehicle which are being developed in partnership with some of the leading companies in the motorsport and technology industries.